There is nothing that soothes the soul like going out and hearing live music and watching a talented and creative artist work their magic with a responsive audience. That is one of the underlying principles stoking the music performance arena at the Irish Arts Center in New York City, a small Irish Cultural Center more than punching above its weight in massively overstimulated Big Apple marketplace. Their recent initiatives like their Masters in Collaboration series and more particularly SongLives shows have sparked creativity and new performances at their black box theater space called the Donaghy Theater on the ground floor of the former garage building in Hell’s Kitchen, more fashionably known as Clinton these days on Manhattan’s far West Side in Midtown. 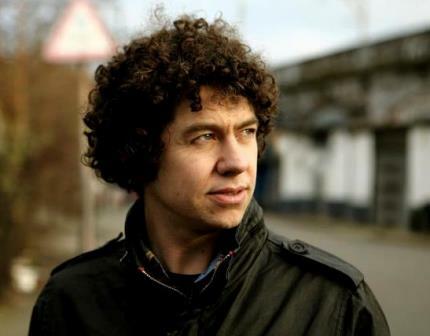 Last year , Dubliner Declan O’Rourke made an appearance with SongLives Curator and singer songwriter Susan McKeown as she sought to give much needed exposure to many gifted Irish singer-songwriters plying their trade on either side of the Atlantic these days. Contemporary folk singers need all the help they can get to muster out folks grown sedentary and housebound glued to television or computer screens. O’Rourke made an amazing first impression in the series and when he was anxious to come back to New York City for a full evening’s show, the Irish Arts Center enticed him with the offer of a one-week residency which was too good to pass up. That residency consisting of eight shows began last Saturday night with a sensational opening night performance by the artist who is far better known in his native Ireland than over here which is something he hopes to rectify by the end of the run in New York. He has produced three cds since 2004 (Since Kyabram/2004, Big Bad Beautiful World /2007, Mag Pai Zai/ 2011) with the first two producing platinum record sales. His most successful song in terms of being covered by others including Josh Groban and Eddie Reader was “Galileo” which he said was “a song that I have been very good to” and which he told the WFUV radio audience a few days before “earns him money when he sleeps” . He sang it early as the second song in the 12-song set that opened with another classic “Time Machine” and featured many of his newest songs from his latest CD. He joked that those who came along only to hear that song “could now go away and do something else with their evening”. No one moved from their seats as he had people in the palm of his hand, including a couple behind me who came all the way in from Cleveland to see him perform live. In January, I saw O’Rourke render a thought-provoking full concert at St. Warbourgh’s Cathedral in Dublin as part of the Temple Bar Trad Festival dealing with a number of songs he has written dealing with the Irish Famine and its aftermath including the fact that his Grandfather was born in a workhouse in the early 20th Century, an outgrowth of the terrible poverty that afflicted Ireland. He sang “Poor Boys Shoes” from that repertoire which he aims to record by the end of the year as another CD project. If there were any opening night jitters or Big Apple anxieties at the first show, they were anything but evident given the well-paced performance O’Rourke performed for the enraptured audience. His stagecraft is an interesting mix of revealing and personal chat and a disarming sense of humor which keeps him from coming across at too serious or introspective. His a cappella encore of "Married to the Sea" evoked the storytelling power of an epic Sean Nos song and was a fitting way to cap his show. Enhancing the stage production Saturday night was a four-piece string quartet containing Christian Herzberger as first violin and Curtis Stewart as second violin, Nora Krohn on viola and Eimear O’Grady. Herberger and O’Grady have worked with O’Rourke in similar string quartets in Ireland and Krohn and Stewart joined in for the New York shows. Along with the varied program he put together it gave the evening a very sophisticated supper club quality which you don’t always experience in black box theaters of this size without detracting from the intimacy between artist and audience that this venue provides. O’Rourke still has five shows remaining at the Irish Arts Center from Wednesday to Sunday and tickets can be obtained at box office phone 866-811-4111 or www.irishartscenter.org. Shows start at 8 p.m. but call 212-757-3318 to confirm the time before going to the theater.